Samsung revealed the design of a possible future bezel-less smartphone in a utility patent filed with the World Intellectual Property Organization (WIPO) in April 2018 and published on November 29. 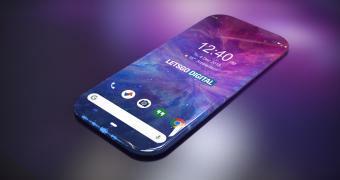 As detailed by the product images included within Samsung’s WIPO patent initially discovered by LetsGoDigital, the bezel-less smartphone will not come with a metal or plastic frame around the body. Moreover, the face and the sides of the potential Samsung smartphone described in the “Display device and electronic device including the same” patent will be entirely covered by a flexible display. Although there are no headphone jack or USB-C ports added to the design presented in the WIPO patent, the final product – if Samsung will ever use it to build a bezel-less smartphone – will most probably feature all connectivity options, most likely on the back of the device.